NASHVILLE, Tenn. - July 4, 2016 - PRLog -- - Whosoever Press-Nate Fortner announced today that he has been nominated for Male Vocalist of the Year in the 6th Annual Heritage Awards. Hailed for their commitment to helping Artists in the understanding, appreciation, and to the advance of the arts to the American culture, the Artists Music Guild, founded by David L. Cook is quickly becoming the leading organization for developing Artists. Winners will be announced and honored at a star-stunned award show at the Union County Agriculture Center, Saturday November 12, 2016 5:30 pm, 3230 Presson Drive Monroe, NC. 28112. "Nominees like Nate Fortner are setting the standard for creative songwriting and performance in the music industry." 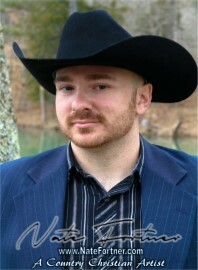 Singer-songwriter, Two-time Male Vocalist of the Year Nominee, Nate Fortner is the definition of Christian Country Music. During the course of his career, He has had the opportunity to share the stage with many well-known Artists. Working with Desert Wind Studios on the recent hit Christian film Brother's Keeper, which also featured Country Music Super Star Travis Tritt, Nate has been a key player in the local entertainment industry. Having performed on television on multiple occasions including Babbie's House on Atlanta's Channel 57 with Gospel Music extraordinaire Babbie Mason (Bill Gaither Homecoming Concerts). Nate has also served as a Boaz Has Talent contest judge with Sandra Lafferty, who starred in the "Hunger Games film," and "I Walk the Line" which featured the life of Country Music Legend Johnny Cash. As a Christian Country Music Artist, https://www.youtube.com/watch?v=WFn_Dl0M7g8 (Watch "Why'd You Take Her Away?" Nate's current radio release). Nate brings a positive inspirational message to the stage. Managed by Golden Sound Promotions. http://NateFortner.com Called to preach at the age of 12 years old and on the run by the age of 19, Nate threw out his suits and ties and anything that reminded him of God. He even went as far to say he was no longer a Christian and moved to Alabama in hopes of a fresh start. By the age of 23, Nate was a regular at all the local bars and night clubs. Then, one night singing karaoke in a little night club in Alabama, Nate ran into an unexpected friend from the past. "I had just walked off stage, and made my way up to the bar. I picked up my bottle to take a drink, and my bottle was empty. At that moment, I felt just like that bottle, empty! Then, I heard a familiar voice from my past begin to speak. The Holy Spirit whispered, 'What are you doing here?' It was at that moment that I prayed, God, if You'll renew me, and make me new, I'll sing Country Music, but I'll sing it for You!"